Wow, Amazon is really putting out the great organic grocery deals lately! Right now they have the organic Earths Best Baby food deal, the organic maple syrup, sugar, candy, and pancake mix deal, and this one! This is for your coffee drinkers out there. 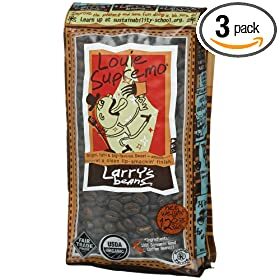 Larry’s Beans Fair Trade Organic Coffee Coffee is on sale for 23% off. You can combine that with subscribe and save (if you want to cancel that after you order you can do so online) and the coupon code LARRYBEA to get an additional 50% off! There have a nice selection of different coffee beans. Just click this link and you can see everything eligible for the discount. Previous post: Vegetarian Times Magazine $3.05/Year – Today Only!